Then what? Can it be sent off to be immediately battled over by a horde of hungry agents? Err…I don’t think so. As all writers know, generally after hard experience, you get one attempt – one chance, which is why it’s essential to bring your story to its most polished state possible before considering your editor, or if you’re bull-headed enough to skip an editor, submitting it to an agent. How is this polished state achieved? Well, there are several ways. If you’re part of a writing forum, you could post your story or excerpt up for peer appraisal and hope to receive constructive feedback. Be prepared, though, to risk getting burnt by flaming critters who might see it as their duty to beat down aspiring writers for any perceived SPAG or style infringement. Or you could as easily be sent off on the wrong path with unqualified advice that your plot needs to twist this way or the other, or that your story needs to heighten/lower the horror/love/fear factor. Yes, you risk a lot putting it out there, unless you’ve a particularly thick skin, or are fortunate enough to have built up a good team of crit buddies. Also, when it comes to sending material off to agents, it had better be ‘Ready to Go’, or as close as possible, because the day is long gone when an agent will take you by the hand, provide an editor, and basically do the work for you. Nope, they want submissions that have the work already done, simply to lessen the graft they have to do and, of course, the expenses they’ll have to fork out on what might prove a hefty risk. So, where to begin? A good question, and quite an easy one to answer, in my opinion. Your first draft is down, time to move to the next phase. My personal practice with short stories and novels is to put the first draft away for a relatively short period of time – maybe three months – just enough to create the necessary sense of objectivity required when facing work that you may be emotionally, and egotistically, close to. In saying that, not all of us have the luxury of being able to do such a thing, but any time spent away from the first draft is time well spent. You want to have a fresh look at it, and this can’t be done immediately after you’ve been working on it night and day for who knows how long. If you can, put it in a drawer, take a chill pill, and go work on something else for a while. Then, when the time comes, get your dictionary and thesaurus out, make yourself comfy, put your non-distraction blinkers on, and away you go. The way I do it is to read the draft through several times. The first read is simply to get a sense of how it feels; how it’s sitting on its own ground. If something sticks out, keep away from it, but make a brief note on a separate sheet – page and line number will suffice at this stage – you don’t want to be unnecessarily distracted from your first reading experience. The important thing happening here is that your subconscious is soaking it all up – taking in spelling, grammar, and style errors, plot flaws, character inconsistencies, etc, etc. You’ll appreciate this when you’re reading through the work again and an editing issue jumps out. Your inner watcher has it all listed on your behalf. Ok so, time to get the red pen out and go on the first attack. During this phase the thing to focus on is each specific sentence in its own right; beginning, middle, and end, one sentence at a time. Is it active? Is the verb strong? And if not, does it still work? Noun/verb/noun – subject/action/object – something does something to achieve something. Read it aloud and see if it stands on its own or if there are weighty adjectives or adverbs that need to be whacked out of it. Go for strong descriptive verbs instead of those awful ‘telling’ adverbs. And remember, this isn’t your final draft so don’t be afraid to get in there and take those unnecessary ‘supports’ out of it. Still focusing on one sentence at a time, zone in on redundant words or phrasing and chop them down. If someone ‘sits down’, cut ‘down’ – same with ‘stands up’. If someone ‘shrugs or nods’ there’s no need to tell us how they use their shoulders or head to carry out these actions. If it’s at all obvious, leave it stand alone, strong and clear. No point in showing us an action or observation, then tell us what we already know. Look for repetitive words or patterns, often words or phrases that have become favourites with us. If a sentence, or paragraph, has repetitive words or phrases, take time out with your thesaurus/dictionary to find a suitable alternative. As you read through, spending time on each sentence, you’ll notice how one might repeat something touched on a paragraph back. If that’s the case, cut and rewrite. Take no prisoners, your reader wants strong, active writing, not to go over something they’ve just read a moment or so before. Check for negative patterns that pull readers out of the story, such as consecutive sentences/paragraphs with the same beginnings: She/He, They, I, John/Mary. A little consideration goes a long way to creating variety. If three consecutive sentences begin with She or I, simply change the second to break the pattern. The same goes for beginning paragraphs. Take a look at a line of beginnings down the page and see if a pattern stands out. Do many of the paragraphs begin with the same word? If so, get in there and tweak. Search out gerunds/participle phrases, where a sentence/phrase begins with an ‘ing’. If there are more than one in at least two paragraphs, step back and rewrite. Such beginnings are a fecker for tripping the reader up. Don’t get me wrong, we all use them, but few and far between is the right way to go, in my opinion. The same goes for the likes of ‘was’ and ‘were’. An ‘ing’ word usually follows ‘was’ or ‘were’, so creating stronger phrasing helps cut the need for them. Watch out for the likes of ‘that’, ‘just’, ‘really’, ‘suddenly’. They’re crutches that we do not need. Cut them out and allow the writing stand on its own strength. Once you’ve pushed through these barriers you’ll never look back. Remaining with one sentence at a time, check for punctuation. Are commas being used properly? Is there a natural pause? Are run-on sentences necessary? Can you chop them back so each clause stands as a statement in itself? On the other hand, would a series of short sentences work better combined into a multi-clausal sentence? This is where reading aloud helps, or getting a trusted friend to read your work back to you. It takes patience, but is well worth it for seeking out those aspects of your writing that are weak. When you’ve read through your draft, marking all candidates for cutting/rewriting, it’s time to start again. Yes, that’s what rewriting is about… rewriting. 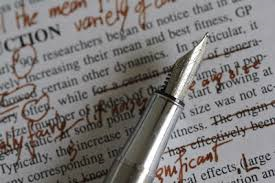 Use a different coloured pen, because this time it’s about the paragraph. Does it work? Is it strong? Active? Clear? Because you can see things from a slightly larger perspective, you can now determine if characters are doing what they’re supposed to be doing. Are they being consistent to their actual character, their voice, their characterization? Are they acting/reacting as you wish them to, in a way that moves the story forward? Are they achieving their objectives, or reacting appropriately if their endeavours are being blocked? Is the paragraph making sense in relation to what’s gone before? If there’s anything needs fixing here, mark it – make a note, and move on. Don’t be tempted to jump back onto your laptop/pc to fix it ‘now’. Hold off until you’re finished your hardcopy review, then apply to your hard-drive document one phase/colour at a time. This way everything is kept specific and tidy, and you don’t lose sight of where you’re at. After the paragraph run, it’s time to focus on each scene. There may be several of these within each chapter so be sure to mark the beginning and end of each one. You’re looking for consistencies again, in story, plot, and character. It’s essential at this stage that ‘fluff’ is balled up and shot overboard. By fluff I mean scenes where nothing of importance happens. If it doesn’t move the story forward or add to the character’s learning arc, then seriously consider cutting it. Fluff is usually a ‘Darling’. You know what they are, I’m sure – we all have them and absolutely hate the prospect of cutting them when we got such comfort from writing them. You’ve got to be brutal and decisive. Cut and move on. You’ll benefit, as will your story. In a story, especially a novel, everything must ultimately connect in order for things to move on. The sequence of events must be credible and believable. They must work. Character actions and reactions must be fully developed to justify events that lead to it and, of course, those that follow. Everything must be justified. Everything. That’s why it’s so important that ‘fluff’ is recognised and targeted. A good example of fluff is dialogue where characters chat about the mundane; the weather, or an itch they can’t get rid of, or the price of tomatoes. Boring! If it’s not pertinent to the story, the plot – if it’s not moving things forward – cut, cut, cut! So once all that’s done, sit your bum down and get to work applying everything to your hard-drive document. Please don’t forget to work on a copy. So important that your original is kept safe in a folder of its own. 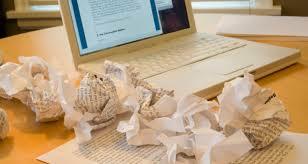 Once you’ve applied your notes, my advice is to take a week or two off before returning to begin your next draft. This is the stage where I would normally put the work out for peer critique, but be sure to proof it well beforehand. Nothing like posting work up only to get a slap on the hand for silly mistakes you should’ve caught during your review.